On March 20, 2017, the Australian government officially made online gambling at casino websites infinitely more dangerous and unnecessarily more complicated. We think the changes to the IGA will just make things worse. Offshore online casino sites cannot, as of 2017, offer interactive gambling services to Australian residents as they could since 2001 under our existing online gambling laws. Essentially, the original Interactive Gaming Act 2001 (IGA) banned operators for running online casinos within Australian states and territories with a a maximum penalty of $220,000 – $1.1 million per day. However, if an online casino was based offshore, it could offer interactive gambling services to players based in Australia with no legal recourse. This was a loophole quickly realised by the Australian community. While outlawing online poker and casino games was always the intent of the original IGA 2001, the wording did not effectively outlaw these foreign Internet casinos, so offshore gambling venues openly advertised and catered to Aussie punters for over a decade. The Act did not prohibit individuals from placing online bets either, so many Australians legally headed to the Web for their casino choices. One of the government’s intentions with the new Interactive Gambling Amendment Bill was to paint the time before the Amendment Bill as some sort of dangerous Wild Wild West scenario, where unlicensed and illegal offshore casino and poker sites were the only options available for Aussie punters. They want the public to think that these new laws will make it safer for Australians. The actual reality is while Australia languished behind with outdated bans and ineffective gambling legislation, other countries like Malta and the United Kingdom proactively established gaming regulation bodies to take control of the increasing popularity of online casinos over the last decade. These countries then proceeded to license both offshore and nationally-based casino websites so they could ultimately better protect their residents from the hassles and dangers of an unregulated Internet gambling market, and ensure people could safely enjoy online poker, slots and table games like grown adults. These overseas regulatory developments actually benefited players all the way Down Under, too. Only the most fair and trustworthy casino sites stuck around and established reputations for trustworthiness within the online gambling community, which in turn also led to the formation of independent self-regulation testing agencies like the eCommerce Online Gaming Regulation and Assurance (eCOGRA) to further safeguard online casino players from shady practices. Certification groups like iTechLabs also came about thanks to these regulators, and helped ensure the Random Number Generators behind our favourite online blackjack, poker, roulette and slots games are truly random and unable to be tampered with. These groups quickly proved offshore casino isn’t some dirty, scary term, and that it does not automatically equate to dangerous and unregulated gambling. What is happening to Australia’s online gambling laws in 2017 and beyond? Aussies have effectively been able to bet real money on our favourite online slots, poker and other table games in heavily regulated and tested digital environments for close to 16 years without needing to worry about shady practices or monetary scams thanks to these international regulatory bodies who kept gambling sites up-to-standard – so long as we did our proper research, of course. There are always going to bad eggs out there willing to take advantage of our money, but the vast majority of Internet casinos abided by the standards set by gambling jurisdiction groups. The Interactive Gambling Amendment Bill 2016, however, is set to screw us all over for the foreseeable future and put an end to playing our favourite casino games online, without the proven safety of overseas licensed jurisdictions watching our backs. Additionally they bill will also seek to upset punters at Australia’s licensed sports gambling and betting sites who will no longer be able to access traditional “free bet” products and credit betting services. The Amendment Bill barely acknowledged the existence of long-established and reputable overseas authorities and jurisdictions, such as the Malta Gaming Authority and the United Kingdom Gambling Commission, and instead focused on less than trusted names to support their warped argument. The Australian government proceeded with the amendments without recognising the exemplary standards already set by the aforementioned groups, and the important developments they have already done to effectively regulate the global online casino landscape. Instead, our government is content to paint all existing offshore casino sites as unlicensed and unsafe cesspools to justify their out-of-touch amendments, and ignore existing regulatory groups which could help as examples for a hypothetical Australian Online Gaming Authority – which for some baffling reason still does not exist. And imagine if it did. The Australian politicians keep whining about millions of Aussie dollars being lost to offshore online casinos, but if they just did what the UK did, the problem would not exist. The United Kingdom Gambling Commission keeps Great Britain in the loop when it comes to issuing online casinos proper gambling licenses to service UK residents, and makes these operators pay gambling tax to the government, which means the money isn’t gone to the wind and is going back into the UK economy. But that seems too hard for the Australian government to handle. Australia has around 198,150 electronic gaming machines (EGMs) accounting for 2.58% of the world’s legally installed slots, and over 80% of us engage in a form of gambling. The former stat pretty much blows any problem gambling argument the government may have for trying to outlaw online casino gaming (“The Internet makes gambling too easy and convenient”) considering it’s pretty freaking easy for Aussies to head down the road to their local club, pub, or RSL and have hundreds of poker machines lined up for play as well. People are going to gamble no matter what, especially online in this age of Internet. Trying to outlaw online blackjack, poker and slots by banning licensed offshore operators is just going to force Aussies who once only played at licensed casino websites which followed the rules and standards set by trusted overseas regulatory bodies to play at black market sites instead. These are the real dangerous venues, the ones that were always willing to flout our gambling laws regardless. What will happen to licensed offshore casino sites catering to AU? With the amendment bill in effect, only an Australian license will do it – but it fails to mention how operators will obtain said Australian license when there is no such thing available, before or after the amendments. If there was, established real money casino sites like Royal Vegas and 7Sultans and poker behemoths like 888Poker and Pokerstars would have applied for a license years ago, just as they already have in other major overseas gaming jurisdictions. Most of the most trusted and regulated offshore casino site brand names that already have licensing overseas have dropped Australian players, some waiting until the last possible minute to make their final exit. In reality, it’s the only action a lot of them can take, while our government stalls to answer what exactly they meant by applying for an Australian casino license when there’s no licensing body to issue them. Leo Vegas is one major casino website well known in the iGaming industry, with licenses granted by the Malta Gaming Authority, United Kingdom Gambling Commission and Danish Gaming Authority and it has already dropped Australian players ahead of the laws. 888Poker, the second biggest online poker brand in the world, left the Aussie markets months ago. 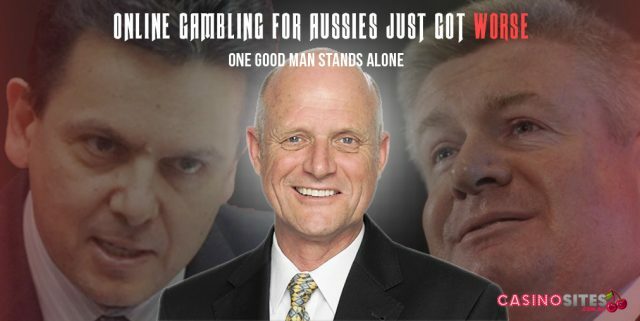 Liberal Democrats senator David Leyonhjelm also believes the amendments will just push Australian residents to gamble at unlicensed casino sites who are willing to flout the laws. “It will promote the black market. There are ways to circumvent these prohibition approaches. People will gamble using foreign providers by various means. They will be in the hands of sometimes shady providers, and if they get ripped off, they will have no recourse,” he told the Huffington Post Australia. We agree. Australians are going to continue to play at offshore-based online casinos and poker rooms, they are still going to continue to use VPN (Virtual Private Network) services to mask their IP location and get around geo-blocking methods. They are still going to bet real money on the Web via their computer or mobile devices, as the new bill targets operators, not players, after all. But the difference post-Amendment Bill? Aussies will instead be wagering on their favourite real money games hosted at shadier, unregulated, untested casino sites instead of the aforementioned globally trusted brands we mentioned above, and will be subject to nasty scams, shady payout practices and other online dangers. It’s already happening within the very passionate and very vocal Australian online poker community, who are receiving advice to move in droves to Americas Cardroom (ACR) and SWCPoker in the wake of 888Poker’s departure and PokerStars inevitable exit. ACR and SWCPoker both operate on bitcoin-only bets and are both well known for ignoring national laws and license requirements in other regions such as the United States. Sure, some Aussies will be smart enough to avoid such unlicensed sites and instead use their VPN and continue to play with their existing offshore accounts at licensed and regulated online casinos and poker rooms. But the vast majority of people are not that tech savvy or can be bothered with such extra requirements, and will most definitely end up playing with unlicensed offshore operators willing to break the law and scam more than a few unlucky players. This is not an outcome any sort of gambling legislation should result in. How can Australian online casino players keep safe? Many licensed offshore online casino sites will continue to offer their services to Australian real money players despite the new amendments, taking a wait-and-see approach. Because Australian residents are not penalised or targeted by the revised IGA legislation, it is to be expected many will continue to play at said sites – as well as at unlicensed casino venues – with a VPN service to get around region-locking restrictions. We cannot recommend players based in Australia to frequent and bet real money at unlicensed and unregulated online casino venues, even if you have a VPN or other security systems installed. You didn’t before the IGA Amendment Bill, and you most certainly should not start doing so now just because the Australian government has introduced some head-scratching new restrictions that have just made things a whole lot worse. OnlineCasinoSite exists as a crucial information source for AU players to keep safe while playing online. We stress the importance of using our extensive resources available on this site which currently caters for our international readers (but still applies to AU players), such as our detailed casino reviews, guide to offshore casino sites and guides on why using VPNs are important, to ensure you bet at licensed by known gaming jurisdictions should you still decide to play for real money. Despite the significant exits, there are several licensed and trustworthy offshore online casinos still accepting Australian players post-IGA. The Interactive Gambling Amendment Act 2016 comes into effect as of September 13, 2017, with the remaining reputable online casino operators withdrawing today. Pokerstars and Karamba have announced they are exiting the Australian gambling market due to the Senate passing the Interactive Gambling Amendment Bill 2016.